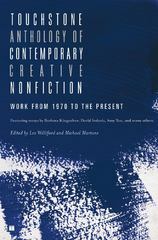 Touchstone Anthology of Contemporary Creative Nonfiction 0 Edition From memoir to journalism, personal essays to cultural criticism, this indispensable anthology brings together works from all genres of creative nonfiction, with pieces by fifty contemporary writers including Cheryl Strayed, David Sedaris, Barbara Kingsolver, and more.Selected by five hundred writers, English professors, and creative writing teachers from across the country, this collection includes only the most highly regarded nonfiction work published since 1970. Contributers include: Jo Ann Beard, Wendell Berry, Eula Biss, Mary Clearman Blew, Charles Bowden, Janet Burroway, Kelly Grey Carlisle, Anne Carson, Bernard Cooper, Michael W. Cox, Annie Dillard, Mark Doty, Brian Doyle, Tony Earley, Anthony Farrington, Harrison Candelaria Fletcher, Diane Glancy, Lucy Grealy, William Harrison, Robin Hemley, Adam Hochschild, Jamaica Kincaid, Barbara Kingsolver , Ted Kooser, Sara Levine, E.J. Levy, Phillip Lopate, Barry Lopez, Thomas Lynch, Lee Martin, Rebecca McCLanahan, Erin McGraw, John McPhee, Brenda Miller, Dinty W. Moore, Kathleen Norris, Naomi Shihab Nye, Lia Purpura, Richard Rhodes, Bill Roorbach, David Sedaris, Richard Selzer, Sue William Silverman, Floyd Skloot, Lauren Slater, Cheryl Strayed, Amy Tan, Ryan Van Meter, David Foster Wallace, and Joy Williams.